When Bitcoin reached an all time high of $25,500 AUD, a market correction took place. It has since leveled out to around $11,200 AUD at time of writing. The current price, sits at about 500% better than it did at the same time one year earlier. If you were early in the game, you should still be sitting on top of the world. The world of cryptocurrency, akin to the lawlessness and volatility of the wild west, has had quite the exciting past year. The hype filled bubble expanded at unsustainable rates, and most of the world was included! A lot of investors made out like kings and queens. Many accounted for multiple thousands of percentages in profit. But at the same time, a lot of people were utterly destroyed, when it all came crashing down. So why then, are there Bitcoin ATMs beginning to pop up all over Australia and the rest of the world? Because blockchain is the future, and cryptocurrency is its vehicle. 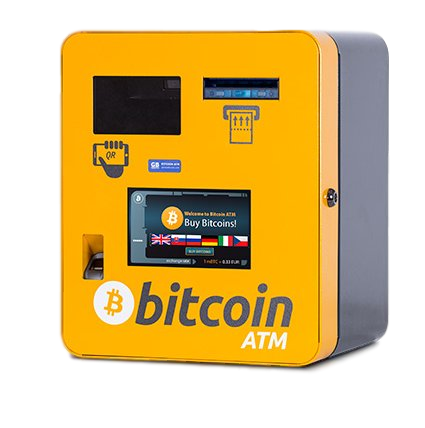 Similar to the world of cars, there are many makes and models of Bitcoin ATM available on the market. The number of manufacturers has reached twenty, and is still growing! This is good for the availability to the public. But, there are just as many different ways of processing the buying and selling of bitcoin! Luckily, here in Australia, there are only four manufacturers that cover the entire field of machines. This makes buying and selling bitcoin and cryptocurrencies far easier to prepare for. I will cover the following, in order of popularity: Genesis Coin, Lamassu, and General Bytes. 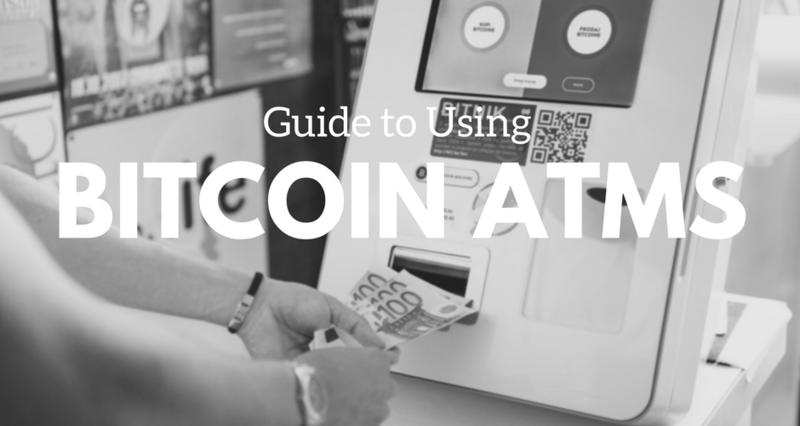 So, let’s jump in and discover everything you need to know about how to use Bitcoin ATMs. Genesis Coin offers two models to the market. The Genesis1, and the Satoshi1. The Genesis1 is the company’s flagship model. 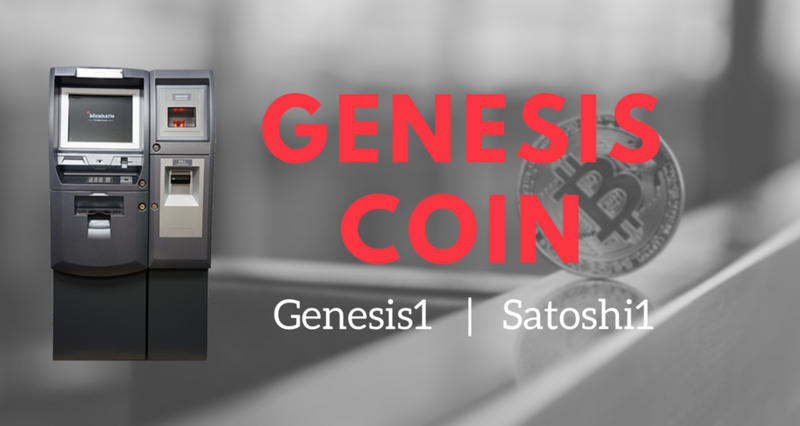 The Satoshi1, named after Bitcoin’s mysterious creator Satoshi Nakamoto, is their “Cash-To-Crypto” machine, while the Genesis1, is their true to form ATM, where you can buy and sell bitcoin for fiat cash. 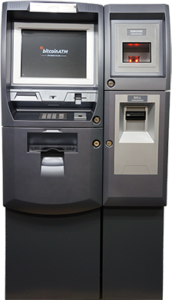 Each of these machines, are equipped with high resolution screens, and ATM-like visual qualities. It is easy to build trust with the professional appearance of these machines. Especially knowing they have plenty of options to utilize for adhering to AML and KYC laws. Here are some of the features they’ve shared between each of their models. Large, Secure, and Robust appearance. Intelligent Alert System – Detects issues and sends alerts when assistance or maintenance is required. A constantly growing list of supported crypto coins, including BTC, LTC, DOGE, BLK, and more. This is the company’s flagship model. It is the top of the line, when it comes to cryptocurrency ATMs. It can buy bitcoin, as well as sell bitcoin. These machines are capable of holding 2,200 banknotes. This means it is going to be capable of any sized cash transaction that you can throw at it. And any transaction you can withdraw from it either! Click “Buy Bitcoins” Enter Mobile Phone Number and Press Done. You’ll immediately get a text message with the code needed for verification. Enter the validation code that you received on your phone. Scan your fingerprint, to the right of the keypad. It’ll ask you to do so, 3 times, for fingerprint accuracy. Select the type of coin you want to purchase, that is available at the ATM. Scan the QR Code on your phone’s wallet, on the right. Insert cash, one bill at a time. The machine will automatically identify how much money you’ve inserted, as well as what it’s worth in the currency you’ve selected. Click “Finish,” to complete your transaction. A receipt will be printed. Select the type of coin you want to purchase, that is available at the ATM. Insert cash, one bill at a time. The machine will automatically identify how much money you’ve inserted, as well as what it’s worth in the currency you’ve selected. Click Send, to complete your transaction. A receipt with a private QR and a public QR will be printed, with how much you have just purchased. This is your only copy to your money, so save this for later usage. It is strongly advised to immediately move it to a more secure location or wallet. Select “Withdraw Cash,” on the right. There may be other alt coins supported, and if so, you can withdraw from your altcoin wallet. Select the amount, you want to cash out from your wallet. A QR Code will appear, that will allow you to send the appropriate amount of Bitcoin to. You are essentially sending yourself money from your wallet, to your physical location. Follow the steps on your phone’s wallet, to send the Bitcoin. This will send your bitcoin to the ATM wallet, and simultaneously print out a ticket that you will need, to redeem for cash. This is the only speed bump in the process, as you then have to go back into the machine, to redeem your ticket for cash. It will now dispense your cash, as it processes the transaction over the network. This is Genesis Coin’s 2nd Generation Model. Generally used as a cash-to-crypto, it would be considered their entry level machine. It does have an option for cash dispensing, but it is not quite as robust as the Genesis1 in that case. Being a newer, sleeker model, it has a tall and narrow 21” screen. Nearly all options are identical as far as the buying process is concerned, including the steps. They will be repeated, for the visual sake of this article. Enter Mobile Phone Number and Press Done. You’ll immediately get a text message with the code needed for verification. Enter the validation code that you received on your phone. Scan your fingerprint, to the right of the keypad. It’ll ask you to do so, 3 times, for fingerprint accuracy. Scan the QR Code on your phone’s wallet, on the right. Click “Finish,” to complete your transaction. A receipt will be printed. Originally the name of Assyrian Protector Deities. They were famously depicted as Human Headed Bulls with Wings, and Human Headed Lions with Wings. Known as a symbol of power, and protectors of life. It is interesting to see the Bitcoin ATM named after such characters. A silhouette of the beast is used as their logo. 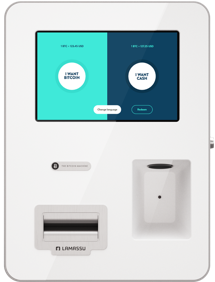 Lamassu ATMs are hailed as the underdogs of the professional Bitcoin ATM world. Their claim to fame, is their simplicity and price. By choosing the name Lamassu, they have done their best to set themselves up to be the protectors of the original idea and function of cryptocoin. For a lack of better words, the company designed their ATMs based upon “simplicity and ease of use” – one of the great benefits of using ATMs to grab your crypto. Without verifications, the machine is able to convert cash into crypto within fifteen seconds! Staying true to simplicity, there is only one model offered, the Duoro. There are no bells or whistles needed. Just a bill verifier, a QR code scanner, and a screen, all packed within an eye-catching white design. The machine is capable of converting cash to crypto in about fifteen seconds! A constantly growing list of supported crypto coins, including BTC, ETH, LTC, and more. Scan, Insert Bills, Send. Almost faster than it took to type this bullet point! There is an option for cash out, and it’s modular by design. 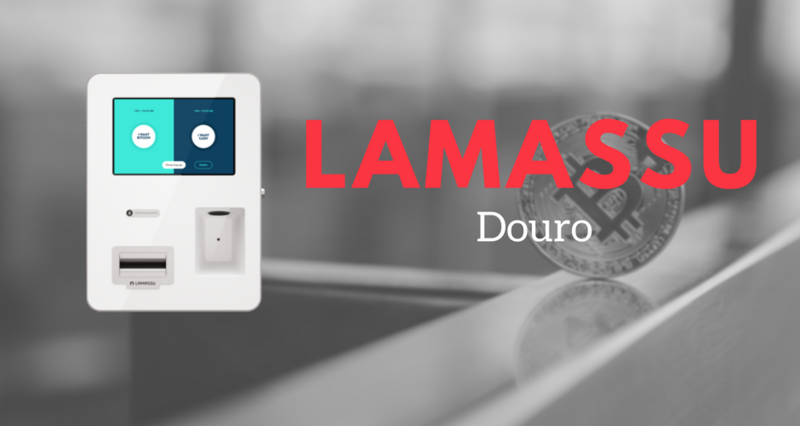 The Duoro ATM can be initially bought for providing cash to digital currency only, and then later upgraded to provide the crypto to cash option! They’ve even made sure they designed it to work with any Duoro ever deployed into the real world! That, is a great way to make it easy to initially provide, and upgrade! This will be on your phone’s wallet, or on a paper walltet that you have printed ahead of time. At this point, your purchase will take about fifteen seconds to process. You will then see a confirmation on the screen, as the transaction is sent to the network! Keep in mind, there is no receipt printer, so you will need a picture if you wish to keep a transaction record. Click the corresponding banknote denominators on the bottom of the screen, until you have achieved the amount you want in cash. If you want $15, you would click the “5” three times, to add up to 15, as an example. The screen will show you in real time how much you’ve asked for. If you’ve messed up your amount, simply click clear, on the bottom right to start over. This will generate a QR code for your phone wallet to scan, when in the send mode. When you do this, it will auto populate your necessary coin amount to match the cash requested. On the phone, click send, followed by confirm. The ATM will see this transaction instantly, and dispense your cash, while the screen shows a confirmation of the transaction. 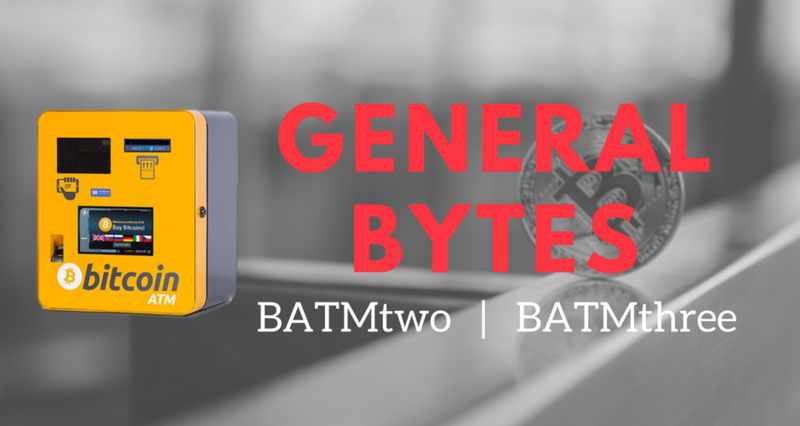 General Bytes offers two models, with various options. They are known as the BATMtwo, and BATMthree. The BATMtwo is designed as a “cash-to-crypto” buying station. The BATMthree will work to purchase, as well as withdraw, as a normal ATM. These machines are packed with innovation and security, so it is easy to see why they are market leaders. Here are a list of features shared between all models. Bitcoin Accessed by QR Scanner, Email, or Cell Phone Number. Bi-monthly updates to machine software, ensuring they are kept secure from exploits. Scam and fraud blacklist, shared across their entire network, to protect against fraud. Multiple options for adhering to AML and KYC laws around the world. A constantly growing list of supported virtual currency, including Bitcoin (BTC), Ethereum (ETH), Litecoin (LTC), DASH, Dogecoin (DOGE), and more. This model consists of two versions. The Classic, and the Large. The only difference between the two machines are their holding capacity of the cashbox. Classic can hold 600 banknotes, while Large doubles that capacity to 1,200.They have a 7” screen, and can be wall mounted or upon a stand. Let’s walk through buying bitcoin. You can either use an existing wallet, or have one set up for you. First, I’ll walk you through buying with an existing wallet address on your phone. We will use the QR scanner for this. Then I’ll walk you through buying bitcoin with your email, and a new wallet set up just for you. Choose Language, by clicking the flag that represents your language of choice. English will be the default option all the way to the left, here in Australia. Click below, “Buy Bitcoins” to confirm your selection. Pull up the QR code of your wallet, on your phone. Hold your phone with the QR Code on the screen, up to the scanner on the upper left of the machine. Insert cash into machine, one bill at a time. The machine will identify and calculate the bill inserted, and its corresponding exchange amount in bitcoin. Click “Buy Bitcoins” on the upper right of the screen. It will process the transaction, which takes about 5-10 seconds. The Transaction Completion Screen, shows how much bitcoin you’ve just purchased, how much currency you’ve spent, and a Transaction ID. Click blank line, which will pull up a keyboard input screen. Carefully type your email address, and verify you have made no mistakes. This email address will be where your wallet link will be sent. If you make a mistake, you will not be able to receive your bitcoin. Click “Done,” to close the keyboard input screen. Click “Done,” on the bottom right. Write down, or take a picture of the “One Time Password” for your newly generated bitcoin wallet. The generated wallet will have a link to it, emailed to your designated email address. It will be a string of random characters. 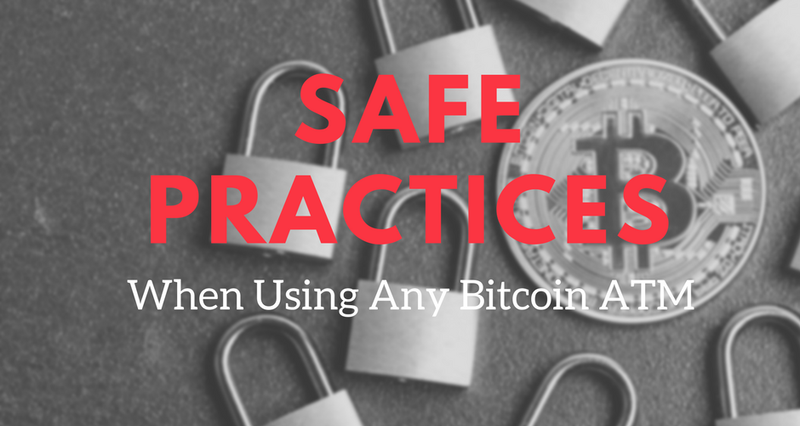 This is very important to record accurately, as otherwise you will not be able to receive your bitcoin. This model consists of five versions. BATMThreeS, BATMThreeL, BATMThreeM, BATMThreeXL, BATMThreeXXL. Take note, the BATMThreeS works one way only, as a large form cash-to-crypto location. All other versions have cash dispensing capabilities. Their differences are mainly the size of bill holding capabilities. This will dictate how much cash can be inserted, as well as how much cash can be withdrawn. Regardless of version, each is equipped with a large 23” full HD display, which is also a touch screen. The most notable process, is the paper wallet generator. If you have no means of an online wallet, you can create a paper wallet, complete with a QR scanner, for later purchases! An interesting feature, is the cash limit selector. Before you are able to buy any bitcoin, you select if you are going to be submitting a small, medium, or large amount of cash, into the machine. Follow me, step by step, as I walk you through the steps of buying bitcoin on the flagship model of General Bytes. First I’ll walk through, and generate a Paper Wallet. And then I’ll do a second walkthrough, with a QR scan code. Choose the appropriate amount of cash limit you plan on spending. Click “Don’t Have a Wallet” on the Bottom Left of the screen. Click “Create Wallet” on the Bottom Right of the screen. The machine will simultaneously print out a QR Code for you to use, as well as create a wallet for you to use to store bitcoin. At this time, the machine will go back to the initial screen. But now, you have a QR code and a wallet to send your purchased wallet to. Scan QR on machine, just below screen to the right. At this point, you will have a green screen that will tell you your total bitcoin purchased, and the amount of money you used to do so. It will simultaneously print a receipt. Choose the appropriate amount of cash limit you plan on receiving. 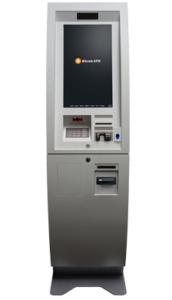 This will send your bitcoin to the ATM wallet, and simultaneously print out a ticket that you will need, to redeem for cash. This is the only speed bump in the process. First you have to wait for a confirmation that the Bitcoin transfer has is completed. You then have to go back into the machine to redeem your ticket for cash. Scan QR Code from the ticket that was just printed. It will now process the ticket, and dispense your cash. Most people deal with small amounts of money. But there are a few who are attracted to the potential for anonymity. If you are one of these people, and have sizeable amounts of money that you are wanting to use, make sure you’re being safe. In order to streamline your process, it would be beneficial to already have a wallet set up on your smartphone. This way you can get in, make your transaction quickly, and be on your way. Protect your wallet’s password with your thumbprint. Most phones these days have this capability. Or at a minimum, use a password that you don’t use for anything else. Make your ATM transactions during daylight hours. Crime happens all the time, but there are usually more people out and about during the day. This translates into more witnesses to identify any potential criminals. The additional light is also easier on cameras to record a criminal accurately, in case of robbery and/or theft. If you are planning a large transaction, call ahead of time, and ask to speak with a manager. At a convenience store for instance, you can ask to have them close and lock the door for the few short minutes you would need, to load your cash into the system. I wouldn’t suggest asking for this request if it was just a few hundred dollars. But, if you’re about to load a couple thousand dollars, they shouldn’t have any problem. Remind them that they’re about to make a sizeable profit in ATM fees, as it is a small percentage of transaction, unlike a flat fee of most standard ATMs. If you’re using a paper wallet, it’s akin to stuffing money in a mattress. A fire could destroy it, just as easy as washing the laundry without checking your pockets. The best thing to do, is to transfer it to a digital wallet as soon as possible, to avoid this potential risk of accidental destruction. Or, if it’s a substantial amount, you could put that piece of paper in a safe deposit box, at an actual bank.